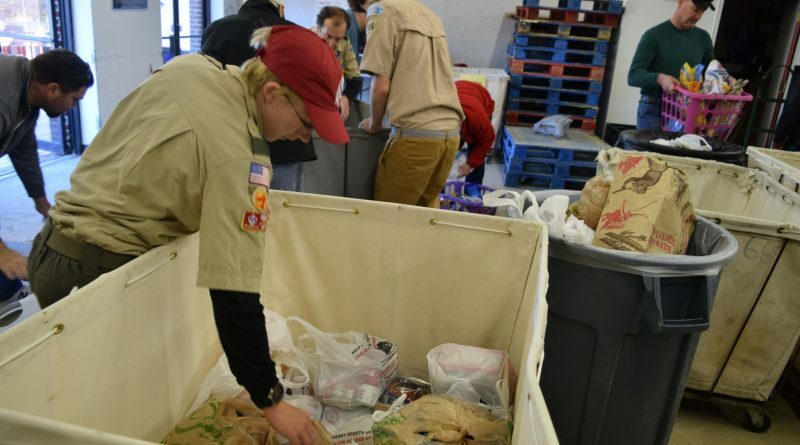 After a weigh-in, scouts begin sorting donations at the Loudoun Hunger Relief collection site in Leesburg. Check your doorsteps on Saturday. Many homes in Loudoun County will receive a Scouting for Food Post-It note with directions for food items needed to replenish the stockrooms of eight local food pantries. Each November, Cub Scouts, Boy Scouts, Venture Scouts, and their leaders of the Goose Creek District of the National Capital Area Council take to the neighborhoods of Loudoun County in support of Scouting for Food. The mission of the service project is to collect food items that will be given to families needing assistance within their local communities. The scouts will return to the homes that first received their Post-It notes Saturday, Nov. 10, to pick up the filled bags of non-perishable items and deliver them to collection sites around the county: Catholic Charities (Leesburg); Dulles South Food Pantry (located at the Arcola Methodist Church); LINK (Sterling); Loudoun Hunger Relief (Food collection is at the side of Rite-Aid at King Street & Catoctin Circle – Leesburg); Messiah’s Market (Ashburn); Seven Loaves (Middleburg); Tree of Life (Purcellville); and Western Loudoun Food Pantry (Lovettsville).